Make the stock according to the instructions on the pack. Leave to simmer in a pan while you start the risotto. Heat the butter and oil in a heavy based pan over a medium heat, then add the onion and garlic and sauté until translucent. Add the rice and cook for a couple of minutes until all the grains are coated with oil and starting to turn golden. Pour in the wine and cook down until it becomes fragrant. Continue to add the stock to the rice until the mixture becomes thick and viscous. When all the stock is added, check the texture of the rice - you may need to add a little more boiling water to get the risotto to the right consistency. But remember, it should be ‘al-dente’, not soft and mushy! 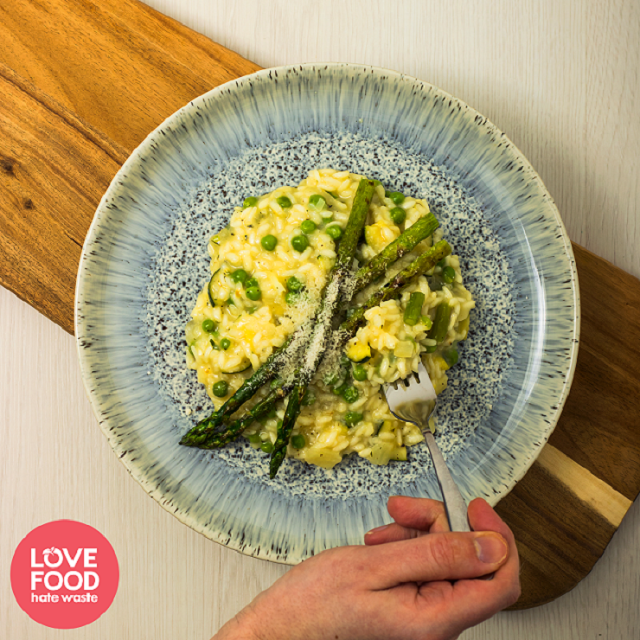 When the risotto is cooked, add a generous pinch of dried mint, some salt and pepper, and the grated parmesan and stir well. Griddle the reserved asparagus spears to serve on top of the risotto, along with an extra sprinkling of parmesan cheese. Vegetarian Haggis is great in leftover dishes, give this one a try!